Try to act shocked, but a recent study found that older, conservative web users share links to fake news sites via social media more often than any other groups. The study, published in the journal Science Advances, interviewed 2,711 Facebook users to examine how often people from different demographics shared links to debunked news sites during the 2016 U.S. presidential election. Researchers found that Facebook users over the age of 65 shared links to fake news sites seven times more often than users between ages 18 and 29, and more than twice as often as people ages 45 to 65. Researchers also found that very conservative Facebook users shared fake new links nearly seven times more often than self-identified liberals and moderates. In fact, liberals “essentially shared no fake stories,” researchers said. This doesn’t necessarily mean that conservatives and older people are more gullible. It might merely reflect the fact that there was far more fake news aimed at older and conservative social media users during the 2016 elections, especially thanks to Russian troll farms trying to sway public opinion. 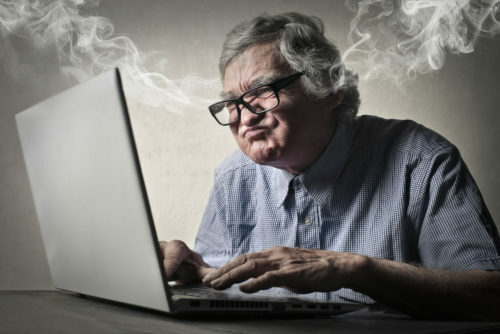 Researchers also think that older web users could have a lower amount of “digital literacy” helping them detect fake news. Either way, one lead researcher said sharing false information is “less about beliefs in the facts of a story than about signaling one’s partisan identity,” which explains why pointing out the incorrectness of fake news does little to dissuade others from sharing it.